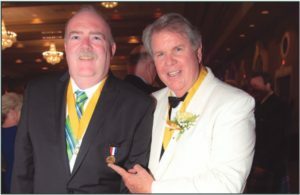 In a surprise presentation at our AOH 2018 National Convention in Louisville, Kentucky, Rockland County’s Neil Cosgrove was honored with the AOH Commodore John Barry Medal. This was the very first granting of this award by the National Board. The AOH Commodore John Barry Medal was named for a patriot whose service and commitment were both generous and extraordinary. Clearly, the presentation of such a prestigious award to our own Neil Cosgrove bespeaks the recognition and gratitude that he so richly deserves.